It's finally done! Well, technically it was done almost 2 months ago, but let's not get bogged down with semantics. I made this quilt for my sister-in-law, Katie, who was having her first baby, a boy...now named Simon. I sent her over to Hawthorne Threads and she made me a long list of her favorite fabrics. Willow by Alexander Henry was on there, so I ordered a fat quarter bundle to simplify things. Then I popped over to All People Quilt and looked up some patterns. I ended up settling on the Fresh 4 Patch Table Topper. 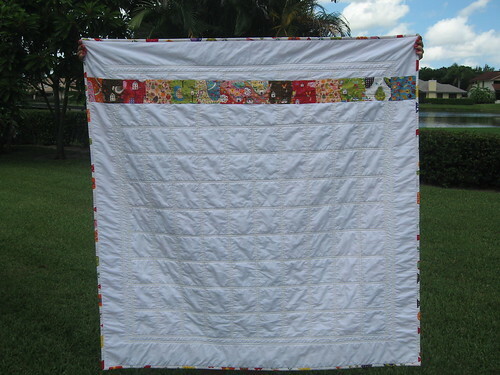 The quilt ends up at about 50" square, which is a great size for his crib or just hanging around the house. I'm really pleased with how it turned out and so was mom. Here it is! A big thanks to my mom and her weary arms for holding this up while I played photographer. Close up! That upper left square is just my favorite in the entire thing! It's like a little path leading into the quilt, inviting you into a cute little cottage. My first pieced backing! I've made a couple of smaller baby quilts before, so this was my first time having to create a larger backing. I thought it would be fun to include a sampling of prints from the front. 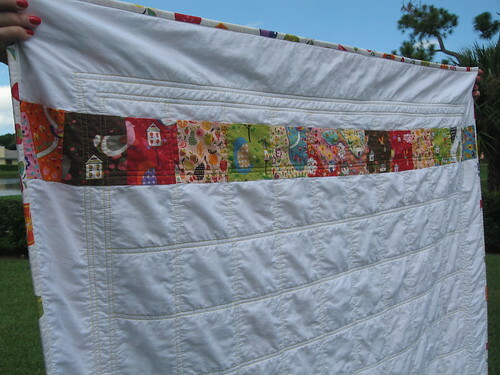 You can also see all the straight-line quilting really well here. I outlined each square and border with 1/4" seams on either side. It's the most detailed quilting I've done and took a few hours, but it was worth it. I love how this strip turned out! I got one of those fancy dancy fabric pens and made this my signature block. I've been very bad about not doing those, so this was a nice and easy way to do it. Now that we're sure about his name, I have to go back and fill it in. Beautiful and colourful! I love this and I like that simple back with just some colours! Amazing, fun, adorable!! I love that fabric line. I also love breakfast for dinner!! Very pretty fabric choice and a wonderful result! So bright and cheery! Love it! I also love the delayed response as it gets around to everyone that you've made something. Part of why I enjoy giving hand made items. Love all the bright happy colors! Perfect for a new little one. Beautiful quilt. 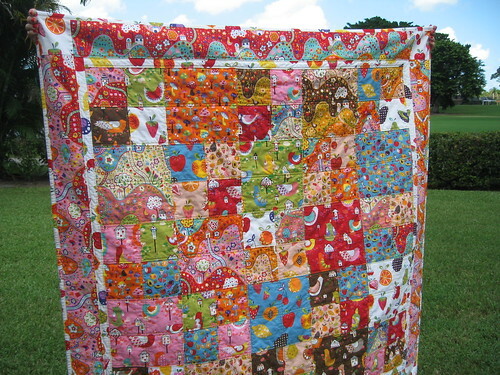 This is such a beautifully bright and cheerful quilt! The fabrics are adorable (esp that one square you pointed out). Thanks for sharing! 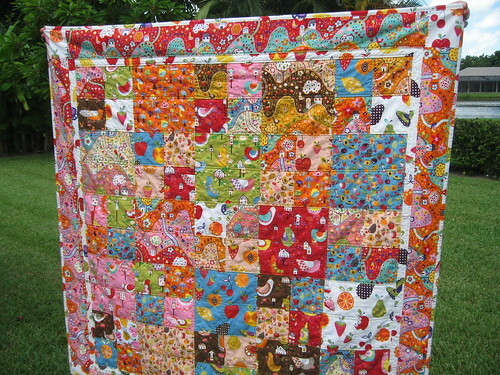 I love all the happy fabrics and colors in this quilt. LOVE LOVE LOVE love love love...so cute! such a fun baby quilt! Yes handmade gifts are the best to give and recieve!! 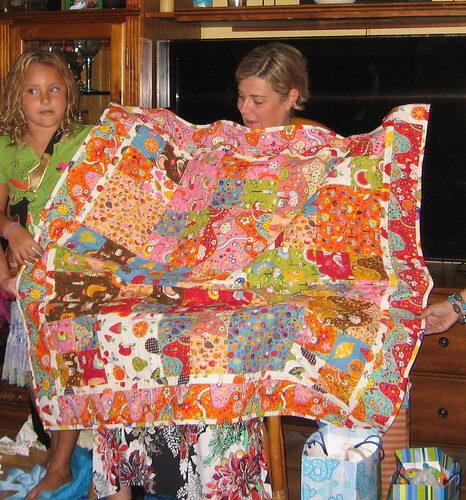 I LOVE this collection, and you did such a great job with your quilt. I have mine sitting, waiting until one of my kids obliges me with another grandchild. Great quilt. Thanks for sharing. 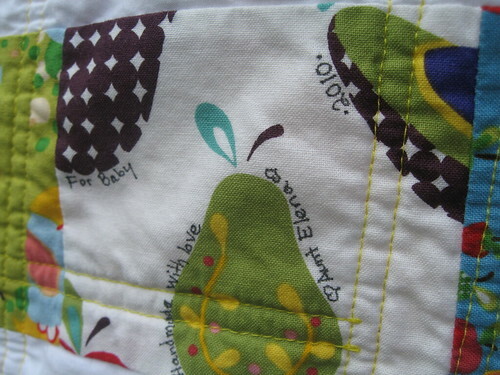 Crib quilts are always such fun to make and so so loved. That is gorgeous, love those fabrics! Beautiful! I love it. Thanks for sharing! I am now a follower of your blog and I look forward to many more beautiful quilts. I love that line and have never bought any because I struggled with what to do with it. I love the simplicity of this quilt. p.s. I've always loved the name of your blog. We bfd here a lot. Oh it's SO cute!! I would have loved a gift like that with my babies! :) The color is fantastic!! Your quilt is SO vibrant and beautiful. I love it. It's amazing. Lots of very interesting looking fabrics. Fun collection of prints. I like how you labeled the quilt. This is an incredible quilt! I love the way you quilted it. 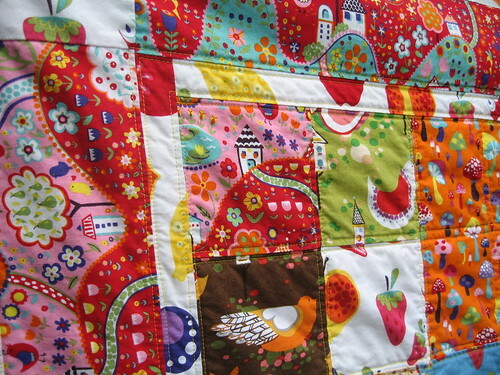 i love how colourful this quilt is, how you quilted it and also the back is very nice. congrats! I'm stopping by on the festival. This is an adorable quilt! Love it! 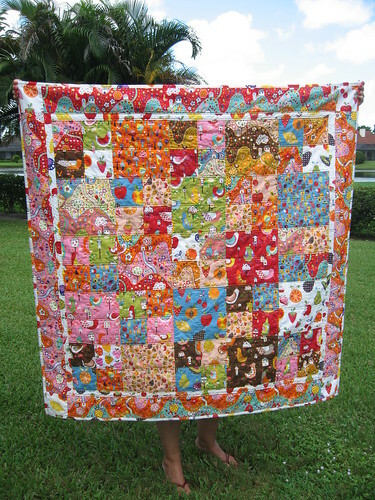 This is such a bright vibrant quilt! It looks great. What a wonderful gift! i love this...the fabrics are so cute! !